Are you serious about cost savings? Well make sure your design tolerances can be met! Date: Jan/Feb 2010 updated March 2017. Well, what is a design? When I’ve trained teams in Design for Manufacture and Assembly (DFMA), that has been my introductory question. I have an answer, of course: a design is an instruction and a contract. For each part in the design there is a drawing, and that drawing instructs the supplier what is to be produced. Then, if the part conforms to the drawing, the supplier will have fulfilled his contract – no one further up the supply chain right through to the customer will be able to say It doesn't work or It doesn't fit . Once this definition of the design is accepted, the rather daunting consequence is that it is down to the designer to ensure that the contract is feasible, and the instruction is capable. Much effort goes into analysing designs prototypes, even more into testing prototypes, to ensure the drawing captures every constraint necessary to ensure that the contract is met – that is a large part of most designers’ working day and, hard work though it is, the task is pretty much satisfactorily achieved. But often the process capability (or otherwise) of the design tolerances emerges only after the start of full production, when problems in assembly or of dimensions out of tolerance then have to be addressed. This argument can serve well to get the group to put their issues of the moment aside and to concentrate on how to design for a more capable instruction for a while, but is the issue really serious? Surely these days we are working as multi-disciplinary project teams, involved through the stages of the project, and the old ‘over the wall’ mentality has gone? Yes, organisation and a structured development process help, but what can the design team actually do to address capability and to cut through functional interests and positions that often hide the issues? Perhaps an episode from my own experience as a project manager will explain why am I actually quite passionate about the need to design for capability? I was working as a project manager on a new product development. Looking in on the mechanical designer of the team, I was alarmed by the sheer number of dimensions and tight tolerances on his CAD screen. Surely there was a very high risk that the castings would be out of tolerance somewhere, I ventured? Oh no, I’ve been through the drawing with the supplier, and he assures me he can make it, he said. Of course, the initial samples were out of tolerance, and it came back to me to organise measurements of several samples, corrective action and replacement parts - and make our excuses to our customer and somehow keep his test programme going. The measurements soon showed it wasn’t just a case of tweaking the tooling either: the parts were not process capable, and we were going to have to live with defects. I thought you said you could make that part! I complained to the supplier. Oh yes, they could make it – as well as anybody else, that is. And if they had raised doubts or objections, we might well have taken the job off them and given it to someone else – who would not have been able to achieve any better results. I didn’t concede that at the time, of course, but they had a point. I already knew that some designers put tighter tolerances on the drawing than they really needed, in the hope that the supplier would put in some effort and get at least close. Then again, the designer should be expected to know what was needed to ensure reliable performance, and surely could make a tolerance stack that added up, but how did a designer know whether a tolerance was reasonable, i.e, capable? The sceptic in me came to the conclusion that ‘experience’ often meant no more than familiarity with a similar part: well it worked last time, didn’t it? So if it was unclear how the experts did it, how could a Project Manager ever challenge a designer or a supplier over tolerance? After further brushes with this problem, I started collecting standards on processes of interest – castings, injection mouldings, sheet metal forms, and extracted tables of dimensions and tolerances as standards. This gave an elementary go/no go test for tolerances compared with the standards for a few processes, but when I learnt of a method of actually predicting process capability, I realised this was the answer I sought. If we can predict process capability, we can foresee and anticipate the sort of problem described above before it actually happens. And isn’t that ‘special characteristic’ symbol we were supposed to put on drawings exactly for this situation? A special characteristic is one where you cannot just assume process capability - it must be demonstrated. Here I soon found that a process capability prediction transforms discussions with the supplier. Instead of the confrontational question Can you make this? , show the supplier an estimate that is pushing the boundary of capability and ask if they can show capability results from similar parts they may have made in the past. Challenging a room-full of engineers to improve a measure seldom fails to facilitate a co-operative approach to a solution. 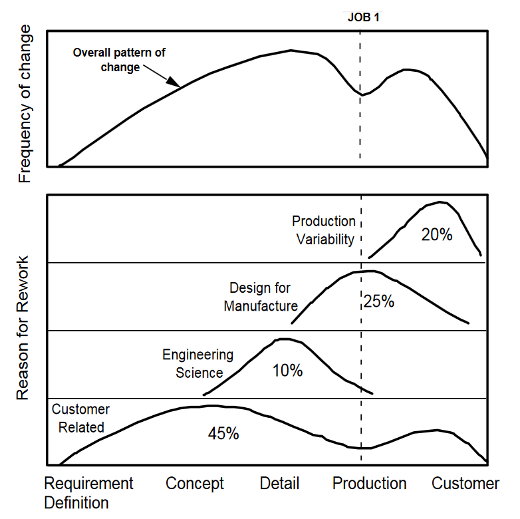 Process Capability is an index where design meets manufacturing. Designers set the tolerance limits and want the parts to be within limits. Manufacturing has to minimise σ, measuring the variation in the process. If the limits are too tight or if σ is too large, there will be defects. The diagram shows the definition of Cpk. 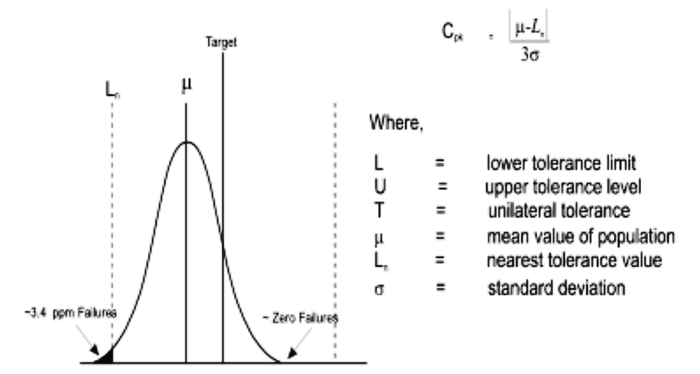 It illustrates the ‘Design for Six Sigma’ criterion: If the designers set the limits of six sigma from the target, and if a drift of more than 1.5σ of the mean from the target can be detected, then there will be a 3.4ppm (parts per million) failure rate at the nearer limit. Process capability prediction helps with other problems for designers and their managers. At another stage of my career I was involved with Six Sigma. How can you deliver ‘Design for Six Sigma’ - what it says on the label – if you don’t have an idea of how many sigma you are likely to get? Then consider statistical tolerancing: instead of adding up the tolerances in a stack, take the root-mean-square of them. OK, it gives a more comforting answer, but when you think it through, it only works if each tolerance is in the same ratio to the standard deviation of its associated manufacturing process, i.e, only if all the tolerances in the stack are equally process capable. But the importance of process capability prediction extends beyond the design department to the whole company: well it would do since it is design that has by far the greatest influence on product costs. Studies show that nearly half of the problems encountered in production are to do with design for manufacture or production variability – that is process capability problems. The costs of the problem can be very high – consider the problem above and the costs involved – not just the rework or remanufacture of samples, but also the time and effort of quality engineers and designers, who should be completing the design of the current product and getting on with the next generation. In our training we suggest these costs may run to 20% of sales, and we believe they can be even higher – hence the title of this article! 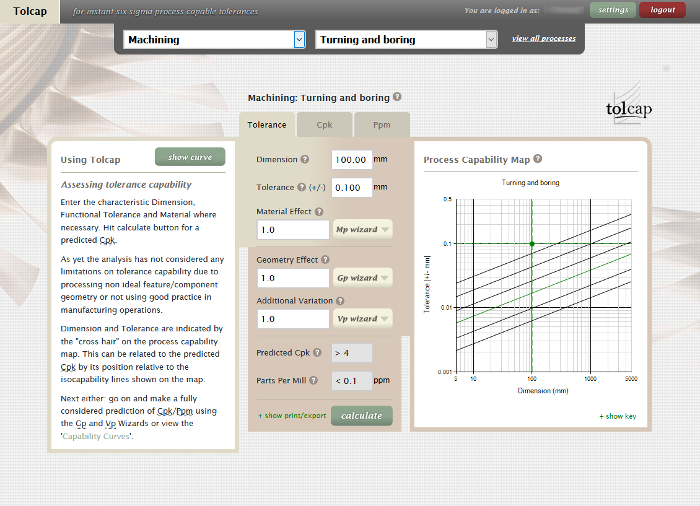 The process capability prediction method is embedded in ‘Tolcap’, a web based tool. 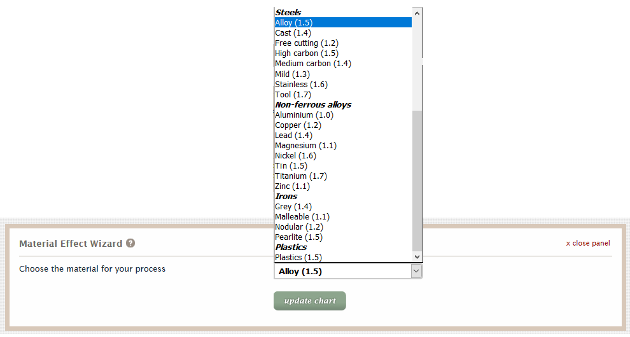 The designer inputs a dimension and tolerance, and Tolcap provides a prediction of process capability (Cpk) in response to the selected manufacturing process, the material and geometry of the part, and some readily identifiable issues in the process itself or its compatibility with the part. The software contains an knowledge base drawn empirically from various sources (international standards, suppliers data, results from experiments) on approximately 80 processes. The data for each process is held as a tolerance – dimension map showing lines of constant process capability. Once the designer specifies a particular dimension and tolerance, the software returns a process capability prediction. Some maps are material specific, but in general this initial prediction is, for a part, from ‘ideal’ material with ‘ideal’ geometry. A material wizard and a geometry wizard (that asks questions about such features as the slenderness of the part, parting lines, repetitive features) and additional variation factors correct the estimate for the real part. Tolcap is available at www.tolcap.com where you can apply for a free trial to check out how it works on your own parts. Tolcap is simple to use and once you have an account it can be opened up to check a capability – or indeed to find out the tightest capable tolerance – with a few mouse clicks. That said, the method does put an extra burden on the designers – not only do they have to get the drawings out for a working prototype, the design has to be capable too! But then, as users have realised, better some problems and pressure early in the design stages than living with problem parts for ever. If you really are serious about your costs, it really does pay to ensure tolerances are capable. 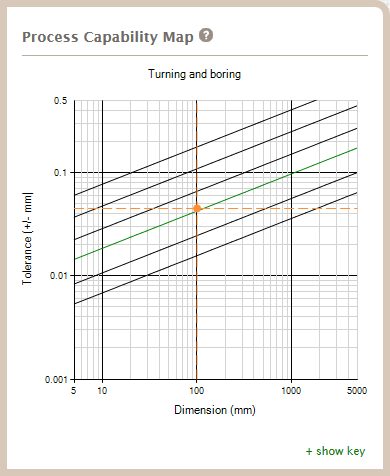 The website also has a copy of the original article in ‘Engineering Designer’ Design for Process Capable Tolerances (pdf 2.5MB), Tolcap videos, and other resources to help you deliver a capable design first time. Batchelor, R, and Swift, K G, (1996), Conformability analysis in support of design for quality , Proc. IMechE, Part B, 2 0, pp37-47. Kay, S, (2007) Save money by understanding variance and tolerancing , Medical Device Technology, 18, 3, May-June 2007. Day, D, Raines, M, and Swift, K G, (2005), Process capable tolerancing , Machine Design, 73, March 2005.